The SBL Handbook of Style has been thoroughly updated to reflect the latest practices among scholars, editors, and publishers as well as to take into account current trends in scholarly publishing. This supplementary site highlights changes from the second edition and notes corrections and additions that will be included in the third edition. 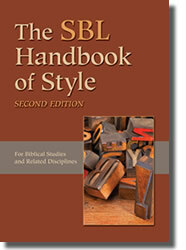 Unless otherwise indicated, all references to the SBL Handbook of Style (SBLHS) on this site are to the second edition. Please send questions and comments about the SBLHS to SBL Staff.